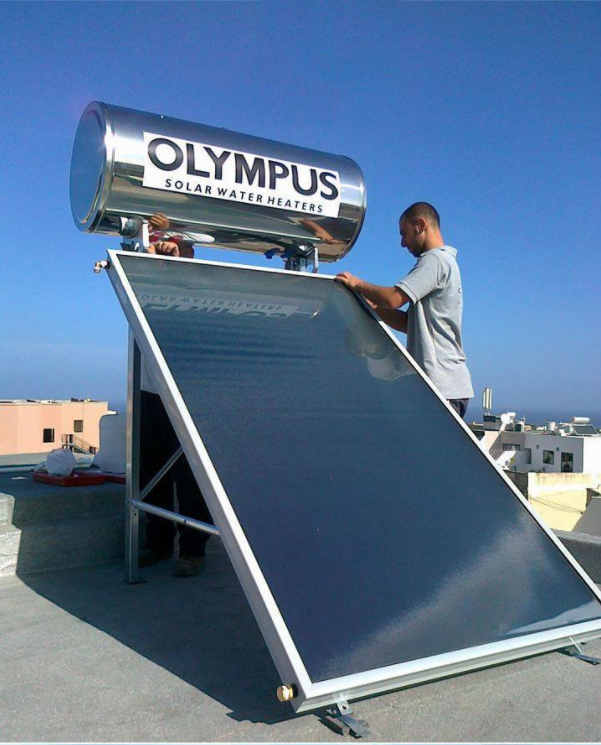 The concept of Olympus’s design was to create an environmentally safe, super-efficient and reliable solar water heater that is durable and easy to install. Every technical characteristic of Olympus SWH is superior to any other product in the international market. Olympus solar water heaters are top-of-the-range, latest technology and designed specifically for the Mediterranean Climate. The system assembles on a flat roof with absolute protection against atmospheric conditions and maximum durability. The specially designed robust fully galvanized-throughout support frame will resist any weather conditions, holds the double insulated, double storage stainless steel, enamel and glass-lined tank, tested 30Bar. This resistance to high pressure makes Olympus more resistant to corrosion than any other solar energy system in the international market. Olympus solar water heaters also have an absolute precision thermostatic 2.0Kw economic electric booster and pure magnesium anode for electrolysis protection, against any corrosive water. Why choose Olympus? CLICK HERE TO LEARN MORE.